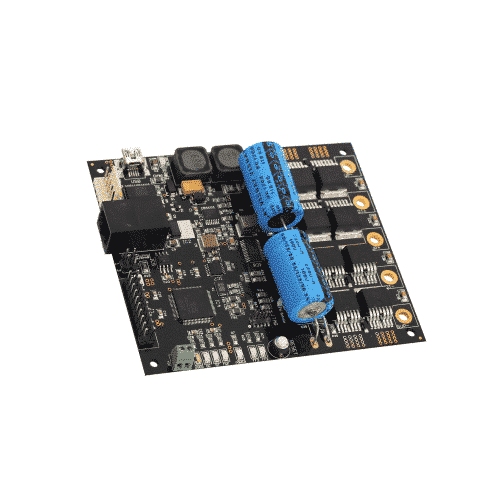 Centaur is a feature rich and high power single DC motor driver and controller board powered by LPC1751 microcontroller. It has CPU of up to 100 MHz and 512KB of flash memory. LPC1751’s on-chip quadrature encoder input (QEI) makes it possible to track the position and direction of rotation of DC motor. Centaur is suitable for precision control robotics and automation application. It can be powered and programmed using USB. It also has JTAG interface for programming and debugging.Centaur is capable of driving high power motors. Maximum motor supply voltage is 36V and can supply continuous current up to 40 A and peak current up to 100 A.